NEW YORK and WASHINGTON (PAI) — More than 200,000 low-wage workers got two big wins in two days. On Sept. 30, New York Mayor Bill de Blasio signed an executive order mandating a living wage for employees who toil for city contractors. Then, on Oct. 1, the Obama administration’s Labor Department (DOL) issued final rules implementing a $10.10 hourly minimum for workers who toil for federal contractors. The two decisions will especially help construction and fast-food workers in New York and fast-food workers whose eateries are in federal buildings and military bases nationwide. Many now earn the $7.25 federal hourly minimum and some of them – due to employer wage theft, including theft of tips for the fast-food workers – earn even less. The workers brought national attention to their plight with campaigns in more than 150 cities. Millions of low-paid workers poured into the streets from Manhattan to Los Angeles and from Chicago to Little Rock, demanding a living wage of $15 hourly, decent working conditions and the right to organize without employer interference and repression. The two actions are among the results. De Blasio’s executive order raises the minimum wage for 18,000 affected workers immediately to $13.13 hourly and to $15 in 2016. The federal $10.10 minimum kicks in starting on Jan. 1 for contracts that the government renews. DOL calculates its new rule will help at least 200,000 workers. Unions, led by the Retail, Wholesale and Department Store Union (RWDSU) in New York and the Service Employees in the national fast-food effort, strongly pushed the president, Labor Secretary Thomas Perez and de Blasio to make the moves, since the GOP-hamstrung 113th Congress refused to raise the U.S. minimum wage or otherwise help low-wage workers. And de Blasio made the cause of lifting up the poorest workers in New York a key campaign plank in his successful mayoral bid last year. “I applaud Mayor de Blasio for following through on his promise to enhance the city’s living wage legislation,” said RWDSU President Stuart Appelbaum, whose union helped defeat former Mayor Michael Bloomberg, real estate interests and Wall Street in 2012 to push the ordinance through the city council. “No one who works full time in America should have to raise their family in poverty, and if you serve meals to our troops for a living, then you shouldn’t have to go on food stamps in order to serve a meal to your family at home,” said Perez of his department’s rule. “By raising the minimum wage for workers on federal contracts, we’re rewarding a hard day’s work with fair pay. This action will also benefit taxpayers. Boosting wages lowers turnover and increases morale, and will lead to higher productivity,” added Perez, who also spoke at the New York ceremony. He praised the mayor – and colleagues elsewhere-for showing the way for the rest of the U.S. to raise the wages of low-paid workers. The new federal minimum wage rule applies to all construction covered by the Davis-Bacon Act, contracts for services covered by the Service Contract Act and concessions contracts, such as contracts to furnish food, lodging, automobile fuel, souvenirs, newspaper stands and recreational equipment to the government, DOL said. It also covers workers who provide services, such as childcare or dry cleaning, on federal property for federal employees or the general public – such as workers for concessionaires at national parks. Photo: (left to right) Bronx Borough Pres. Ruben Diaz, RWDSU Pres. 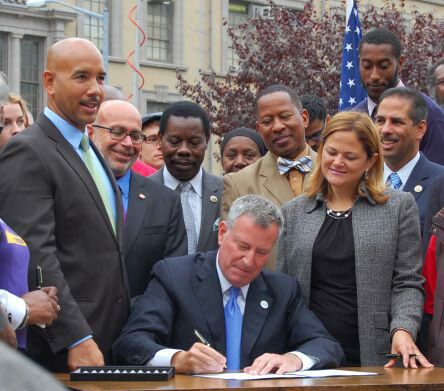 Stuart Appelbaum, Councilmember Mathieu Eugene, NYC Mayor Bill de Blasio, Councilmember Andy King, Speaker Melisa Mark-Viverito, and Councilmember Fernando Cabrera. RWDSU.